I am in love. The object of my affection, or rather, my devotion, is not a person per se, though it is very much alive. It has been alive for 2,000 years, persisting through seemingly insurmountable odds, and in that time it spread from the eastern shores of the Mediterranean north and east, ultimately reaching the shores of Japan, Virginia, Alaska and California. Now it is very much established and thriving here in the United States and across North America. What is this thing that has become such a defining part of my life? 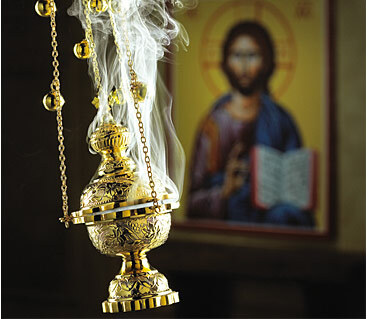 I have fallen in love with the Orthodox Church. It is difficult for me to render into words an account of the transformation that this awakening has wrought in all areas of my life. I feel myself to be at last truly satisfied, spiritually and emotionally. I feel enriched beyond description after years of an ever-present void. From the depths of my heart I sense that I am now a more fulfilled Christian, and above all I know that I am a more inspired human being. Sadly in this increasingly secular society, many people my age do not seem to want or desire such inspiration. For the college student who craves a deeper inspiration that goes beyond a routine weekly church hour, for anyone who wants to enter into a new level of spiritual life, I urge him or her to consider Orthodoxy. It has awakened in me a kind of spiritual consciousness that I never imagined I would experience, a kind of spiritual inspiration that has proven to be my life’s greatest blessing. For this awakening, I am, and will always be, forever grateful. These words open my account of my conversion to the Orthodox faith, Why Orthodoxy, which Pokrov Publications will soon publish as a print and e-book. My friend Jacob Sparks reviewed an earlier version I had prepared before sending it to the publisher, and reviewed the book here at his blog on The Odyssey. I was raised in the Novus Ordo rite of the Roman Catholic Church, and I have many friends, as well as my immediate family members and most of my relatives, who remain Roman Catholic. 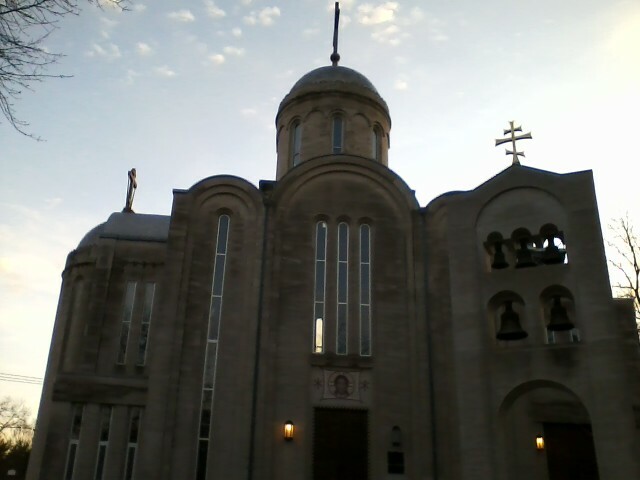 In June 2011 while working two summer jobs in D.C., I was fortunate to have the presence of St. Nicholas Orthodox Cathedral in Washington, where I had been attending Divine Liturgy and Vigil since November 2010. Before this, I regularly attended the Divine Liturgy, Orthros, and Vespers at DC’s St Sophia Greek Orthodox Cathedral. Both of these warm, vibrant communities are pillars of the Orthodox Church in the DC Metro area. Immersed in the life of the parish, which was the primatial cathedral of His Beatitude Jonah, then the Metropolitan of all America and Canada, Archbishop of Washington and Primate of the Orthodox Church in America (OCA), I attended Sunday Liturgy and Saturday vigils with ever-growing wonder and fascination each week. I was not yet a declared catechumen, but by then I had a clear feeling that the grace of the Holy Spirit, which so abundantly filled the liturgies and the hearts of the faithful, had acted to bring me to Orthodoxy. St Nicholas in December 2011 shortly after my chrismation there. Gazing up at the dome inside St Nicholas Cathedral. Sunday, September 30, 2012. One day in June, I was overcome with the sense that I needed to commit to writing all the thoughts and feelings that had been stirring in my mind in the past months. Over the course of three days, while I was writing what turned out to be an initially forty-seven page account of my journey into Orthodoxy, I felt a constant warmth in my soul unlike any other I had ever experienced. Despite almost no sleep, I felt exhilarated and alive in a way I had never quite felt outside of this fevered period of writing. As a writer, I naturally feel a strong sense of attachment to anything that I write – but with this piece, there was something different. I felt as though something beyond me, outside of me, yet also operating within me was moving me, stirring me, to write and revise and add to this document. I wanted to communicate to people my age, especially other Christians and specifically Catholics, why I felt so moved to embrace Orthodoxy and to give voice, insofar as I was able, to my immense gratitude for the gift of the indescribable richness and fullness of the Orthodox Faith. Above all, I wanted to share how embracing and living this life in Christ, this ancient yet timeless Faith tradition, changed my life in so many ways, and how I saw it at work in so many people around me, with God working through them and changing their lives for the better. At one point during the summer, I showed what I had initially written to Metropolitan Jonah, who frequently presided over liturgies at his Cathedral. He seemed astonished, and took the piece, which I had titled Why Orthodoxy, and said he was looking forward to reading it. Having seen him lead the parish in prayer week after week as the Liturgy was offered, the faithful gathered around their bishop just as the faithful did in the early Church, I had come to see what an extraordinarily kind pastor and person he was, and so his wisdom and pastoral guidance during my catechism meant so much to me. I continued attending Liturgy each week, and as I came more and more into the inner life of the Church, I was moved to edit and expand and revise the document in August and September as the academic year began. I became an official catechumen on Sunday September 25 on the feast of St. Sergius of Radonezh, with His Beatitude guiding me through the brief ceremony. During my period of catechism, the very kind Father Valery Shemchuk instructed me in the fullness of the history and the beliefs of the Faith. It was he who introduced me to St. Silouan. 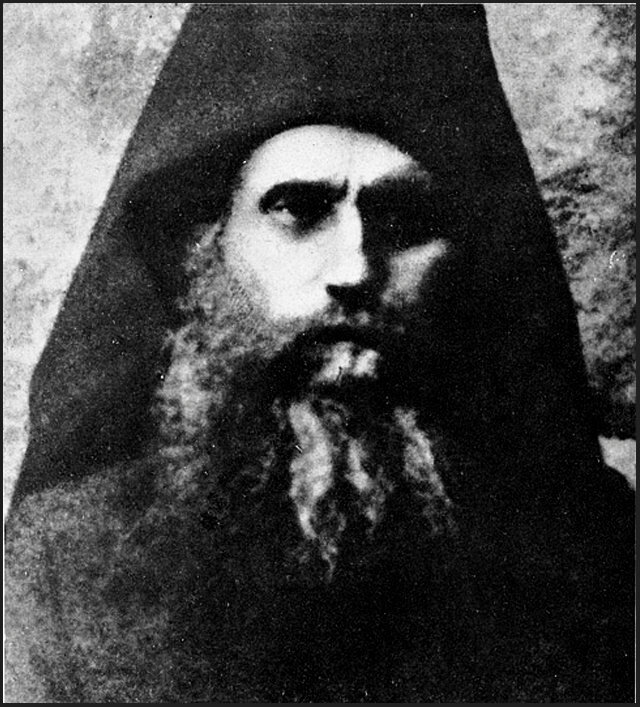 Silouan the Athonite (1866-1938) is my patron saint. He was a Russian peasant who took monastic vows and spent the last decades of his life as a spiritual elder on Mount Athos at the Russian monastery of St. Panteleimon. His writings on cultivating prayer of the heart, love of one’s enemies, and the need to love and have deep compassion for all of creation have moved me more than any other saint. O Holy Father Silouan, pray to God for us that He might save our souls! 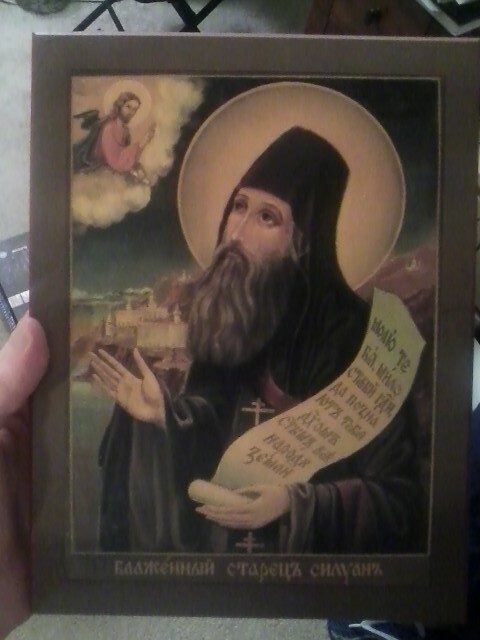 A beautiful icon of St Silouan the Athonite, given to me by someone dear to me. As my limited knowledge of the Church Tradition and her ancient Faith began to slowly expand, I felt moved to add more to Why Orthodoxy in October and November. A few weeks after my chrismation by Metropolitan Jonah at St. Nicholas on December 4, 2011, the celebration of the feast of the Entrance of the Theotokos into the Temple on the Julian calendar, I returned to New York to spend the Nativity holiday break with my family, who, to my immense gratitude, had come down to D.C. for my reception into the Church. My Chrismation- Sunday December 4, 2011 at St Nicholas Cathedral in Washington. There is a beautiful men’s monastery in my hometown, the Brotherhood of the Holy Cross, which is under the omophorion of His Eminence Metropolitan Hilarion, First Hierarch of the Russian Orthodox Church Outside of Russia (ROCOR). H.E. 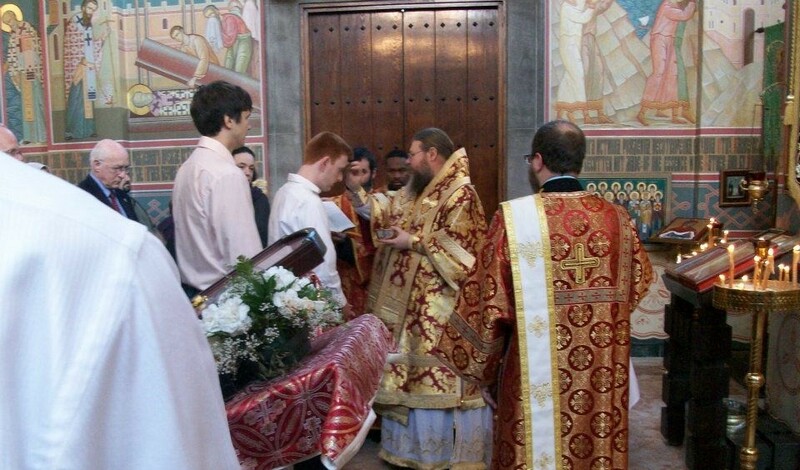 Metropolitan Hilarion visited the monastery in September 2012 for the Julian calendar observance of the Great Feast of the Exaltation of the Holy and Life-giving Cross. The brother monks maintain the beautiful monastery chapel, originally one of my hometown’s earliest primary schools built over a century ago, which is dedicated to St Herman of Alaska, and the beautiful grounds. Archimandrite Maximos, the abbot of the monastery, Fr. Cornelius, Fr. Silouan, Hierodeacon Parthenios, Elias, and others in the community are extraordinarily kind and warm-hearted men. Visitors are always welcome, and you will be unable to refuse the monks’ delightful and varied conversation, offers of several cups of tea, and a variety of fast-friendly snacks. When I left for Scotland in mid-January 2012, my thoughts were still very much with all that I had experienced, learned, and continued reading – the beauty of the Liturgy, the unique mystery and transcendence of Orthodox spirituality, the wisdom of many twentieth century Orthodox theologians, the Church Fathers, and of course the Holy Scriptures. 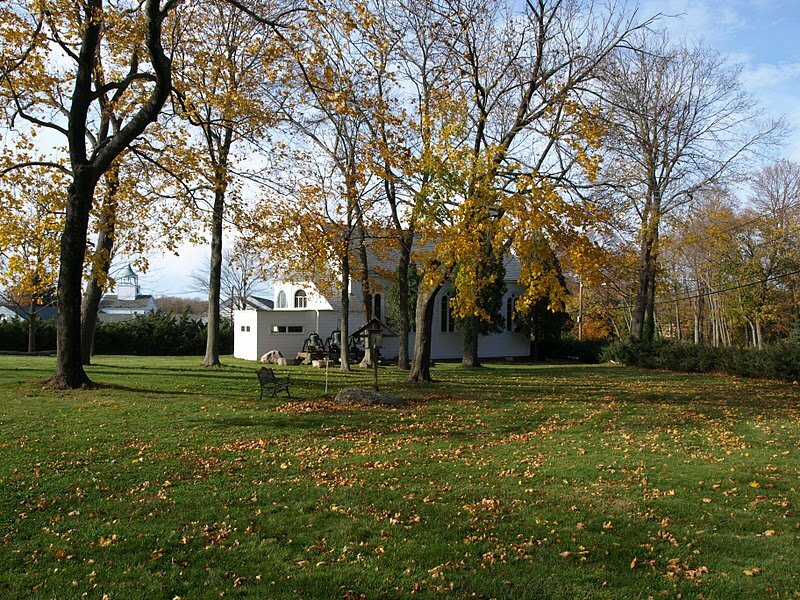 Holy Cross monastery grounds are a beautiful oasis of tranquility in my bustling hometown. The monks are exceptionally kind, and it is a joy to be able to go to Divine Liturgy so close to home in New York! The monastery’s presence in my hometown, and my fascination with it as a Catholic teenager studying different faiths, makes me think my journey to Orthodoxy was truly God’s providence. Inside St Nicholas Cathedral looking out over the church nave from the choir gallery. Photo taken in August 2012. During the spring semester I spent in Edinburgh, worshiping at the beautiful, small Orthodox community of St Andrew, I continually added onto and revised Why Orthodoxy up to March of 2012, and as of Fall 2012 it is now over a hundred pages. After reaching out to several publishers for their suggestions for revisions, I am in the process of revising and refining it further. For now I will share my different musings, articles, videos, podcasts and links on subjects relating to Orthodoxy. I invite any thoughtful and interested comments on any of my posts. I lived again in Washington, D.C. for my senior year at American University beginning in June 2012, where I led the student-run Orthodox Christian Fellowship (OCF). From this time period, you can expect to see many things on my blog related to Orthodox life and different Church activities in DC! In fall 2014, I transferred to the excellent Stony Brook University on Long Island, NY, where in January 2016 I graduated with my BA in History. I am now a MA candidate in European History there. In addition to my current obligations as a university student, I am the graduate assistant in the Office of the Dean in the Stony Brook University College of Arts and Sciences. 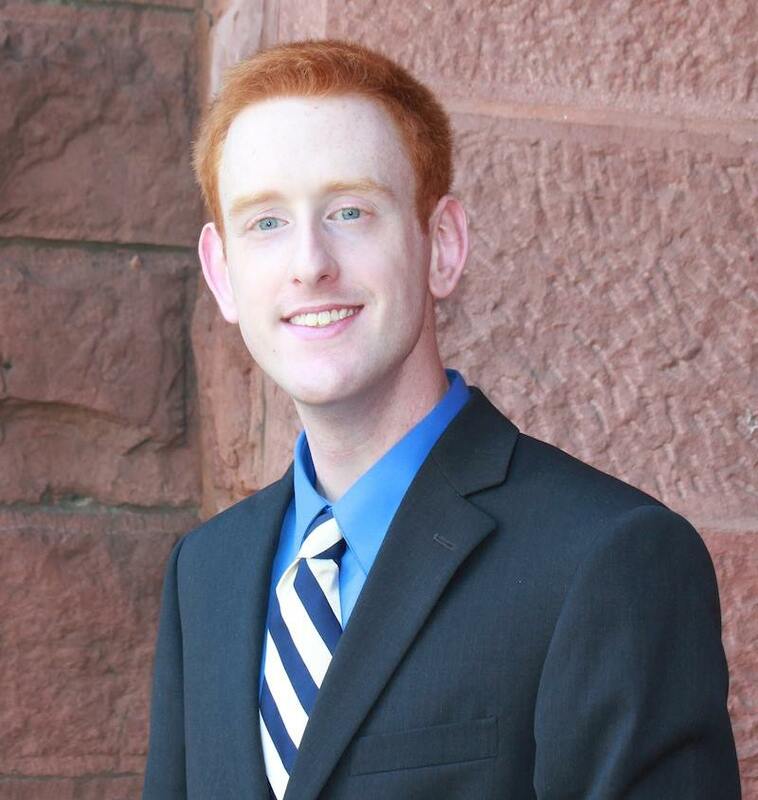 In the recent past, I have also worked in communications for the University’s Office of the Bookstore Liaison and as a Conference Planner for the Stony Brook University Charles B. Wang Center’s Office of Conferences and Special Events. I am a contributing writer at Ethika Politika, an online journal of ethics, politics, and religion. I also write as a contributing historian for the Marie Stuart Society and The Crown Chronicles (TCC), a popular London-based British monarchist blog affiliated with the prestigious British Monarchist Society and Foundation, with which I am also affiliated. You may find my articles for TCC here. I am also a contributor to the BMS Crown and Country magazine and Pravoslavie.ru, the historic Moscow Stretensky Monastery’s popular Orthodox content website. You may find my articles for Pravoslavie.ru here. Besides writing here on Orthodox topics in particular and Christian ones generally, I often write on historical issues, political theory, international royal history, and touch upon contemporary political and social events. I have also worked as a staff writer, researcher and blogger at the Institute on Religion & Democracy (IRD). You may find my articles here at the IRD’s blog page, Juicy Ecumenism. My professional photo for the Institute on Religion & Democracy, where I worked in 2013 as a staff writer, researcher and blogger. Wherever you are, may the Lord bless you and give you peace. I found your beautiful blog “by chance” and I’m very happy of this. I’m 19 and I’m writing you from Salento,south Italy, the ancient “Magna Grecia”, a land of saints,heremits,monks where all the people has been orthodox until the XVII century. Neverthless,many places here and many popular traditions speak still about this past. So,in November,during a pilgrimage at the Holy Mountain,I returned to the Faith of my Fathers,to the fullness of the Faith,to the pure spring of the One and Undivided Church:the Orthodox Church. I received the name of Spyridon because I felt (and still I feel) his strong intercession during this quiet and almost unaware path, driven by the Holy Spirit. I found myself in all of your words: Only now, I feel a Christian in the full meaning of this word after. I feel enriched beyond description after years of an ever-present void in the Roman Church. I have fallen in love with the Orthodox Church who is life,Life in Christ and not a approach arid and legalistic to Him. Having prayed for the unity of faith and for the communion of the Holy Spirit, let us commit ourselves, and one another, and our whole life to Christ our God. Kalo Pasxa! Xristos anesti! Христос воскрес! Your words profoundly touch me. It is such a joy to hear from you, brother in Christ! We are brother pilgrims on this “quiet path” who have sought the faith of our Fathers, the “pure spring of the One and Undivided Church”! How could we not embrace this beautiful Truth which you so perfectly described as “life, Life in Christ”? How was your experience on the Holy Mountain? Which monasteries did you visit? I hope and pray to visit one day. The mountain seems a truly holy place, a world apart, an enduring beacon of prayer for the Holy Church. Truly the Holy Spirit must have inspired your pilgrimage! What a wonderful saint you chose, holy Father Spyridon, champion against Arius and defender of Orthodoxy! He is surely interceding for you before the throne of God. In 2005 I had the joy of visiting Italy with a student organization. I saw Roma, Pisa, Firenze, and Venezia! Unfortunately I did not see any of “Magna Grecia”, Calabria! I would love to one day visit the south, especially Otranto, Brindisi, and Melendugno! I hope to see your beautiful country! Thank you so much for your many kind words! My blog is nothing, only my poor thoughts and reflections on this beautiful Faith, this ancient Path! Every day is a beautiful journey to walk in this Faith, to fall and repent and strive to live a life in Christ. May the Lord strengthen you in these final days of Great Lent, and may your Pascha shine brightly and be filled with joy! Soon may we sing: Cristo è risorto! Χριστός ἀνέστη! Христос воскрес! Christ is Risen! “After 11 days, it’s very shocking the return in this sad world. Everything seems to me useless and as a obstacle for the union with God. It’s necessary to live the Mount Athos in order to comprehend it. It’s no a place for fanatic people. There, I met humble men who show their great love for Christ and for the Fathers Faith with their own life (rather than with the words). Don’t expect to see great miracles. The greatest miracle who takes place there is the grace of God who works in the hearts of these humble men. I was in three monastery: Agiou Grigoriu, Vatopedi and Pantokrator and in the monastery of my spiritual father close to the Holy Mountain. I hope you can visit the Holy Mountain as soon as possible. I’m very glad you visited Italy. In Venezia, there’s our greek-orthodox Metropolis. I live in Lecce,it is the main city of the Salentine Peninsula, where there are Otranto,Brindisi,Melendugno and all the villages where the people still speak the griko “a byzantine language”. We have two greek-orthodox parishes: one in Brindisi (where you can venerate the body of sain great martyr Theodore Tyro,stolen from Constantinople) and the other one in Lecce. During the summer, I live in Otranto,the glorious Otranto! There’s the byzantine cathedral with beautiful frescos,the famous mosaic and the relics of the 800 Martyrs who refused to convert to Islam and so they were beheaded during the Ottoman invasion of Otranto. Otranto was an important orthodox Metropolis of Constantinople (also after the sad 1054). It was the site of the important monastery of Santa Maria Casole, destroyed by the Ottomans in 1480. At the time of the Patriarch Photius, the Bishop Mark of Otranto wrote one part of the hymn that the Church sings in the Holy and Great Saturday. If you want I can email you the pics of the byzantine frescos of Salento. And when you want to make a visit here, you are welcome and our host! Protopresbyter Fr. Aleksander Frenkel-Winogradsky (Israel); also ‘Av_ A’ by the same. Chazak v B’Hatzlacha in Yeshua. Glad to hear about your journey into Orthodoxy. It is not you who chose Jesus Christ, but Jesus Christ who chose you. Although you do have to take your steps along the away. This process of “knocking, asking, and seeking.” is what we are called to do. This is what I have come to fall in love. The learning, the opening up, the more we come to know ourselves. The journey towards Christ is the most amazing experience one could ever ask for. It IS life. I love reading something which makes me feel so totally infant. Just when you think you know, you realize how much you don’t know and never will know! Glad to see we share much of the same passion and zeal for Orthodoxy and the beauty that it is. As a young man with a desire and burning passion for the priesthood, I can understand why the Orthodox spirituality drew you in. Our mystical, deep approach to spirituality is something that interests me a lot and that as a priest (maybe) I can share that with others and help them in their spiritual life. Thanks for sharing. Thanks so much for your kind comments John! I too am happy we have a common love for the Orthodox Faith! I have the same ‘burning desire’ you describe. It is indeed Orthodoxy’s mystical approach to faith and spiritual life which most attracted me; so many people describe this as “coming home”, and for me, it was something partly very intimate, partly truly awe-inspiring. To this day I am filled with awe and awareness of God’s grace just on entering the cathedral in which I worship. As my non-Orthodox friends say when they come to Liturgy with me, “it’s like we’re in another world”. Synthesis of our deep spiritual patrimony with our day-to-day lives is an ongoing challenge, isn’t it? But I feel so blessed that we have this incredible inheritance of faith by which to live and, by God’s grace, allow our lives to be transformed. Our spiritual backgrounds also seem similar- I was raised Roman Catholic and had read widely on and looked into ‘High Church’ Anglicanism (not the ECUSA) prior to encountering Orthodoxy. I took a moment to look at your wonderful blog as well (I love the title! ), and I realized to my surprise that I had once or twice come across it before. Many of your posts are very beautiful and thought-provoking. Thank you for your writing, and I look forward to exchanging comments and thoughts back and forth. I get a similar response from my friends often, brother. It is vastly different, but so rich and profound. I thoroughly enjoy it and getting to discover more and more of it. I just recently purchased The Philokalia Vol I and can’t wait to read a little bit of it. I am particularly interested in St. Hesychias’ works on watchfulness and stillness. I grew up in a Baptist home, went to a Restoration Movement university, met my wife who was going to the Episcopal Church, and then came home. I have a pretty wild journey, but I am glad to be where I was meant to be. Feel free to read and offer your insights. I share your convictions about waiting until one is healed and more mature. Thanks for checking out my blog. I appreciate it. I am trying to build more of an audience with it and do some more blogging. I look forward to that exchange as well. Greetings Ryan! I think I made your (virtual) acquaintance in another post that I’ve lost track of, but anyway, hello again from a fellow Edinburgh/St Andrew’s participant. Funny enough, my priest here, Fr Raphael, was asking me about you—although he at first asked me about a “Silouan,” which at first I had no idea to whom that name corresponded. And then in a separate conversation, talking with Fr Avraamy, someone else just mentioned Silouan = you! So with that context in mind—you’ve been asked about. 🙂 Also for your prayers… I don’t know if you heard, but the archpriest here, Archimandrite John, fell asleep in the Lord two nights ago, early morning April 17th. It was somewhat unexpected for all of us, but there is some bittersweet peace for us. The week before he had just made arrangements for his will and burial—quite providential, it turns out. May his memory be ever eternal. Anyway, I hope all is well with you. The few times, I confess, that I’ve wandered over to your blog I’ve always found encouragement. I hope I may actually get to meet sometime soon. I plan to stop by for the liturgy on May 12th at St John the Baptist, so hopefully perhaps our paths may cross then. Take care, and may your Lent be fruitful. It is a great joy to hear from you again! Yes, I recall that you commented on a post I wrote a few months ago about Metropolitan Jonah here in D.C. Perhaps we can talk more about that post over e-mail if you like? Thanks so much for your message. What a small world it is! Fr Avraamy and Fr Raphael are so very kind; they both made a lasting impression on me during my semester in Edinburgh a year ago. You must ask Fr Raphael to tell you about the Holy Isle, and Fr Avraamy to tell you all about his youth, if they have not already done so! There are so many wonderful people I’m sure you have met – Deacon Luke and his dear wife Marion, the students Jakub and Stephen. . . Please give everyone my love! I remember them in my prayers. 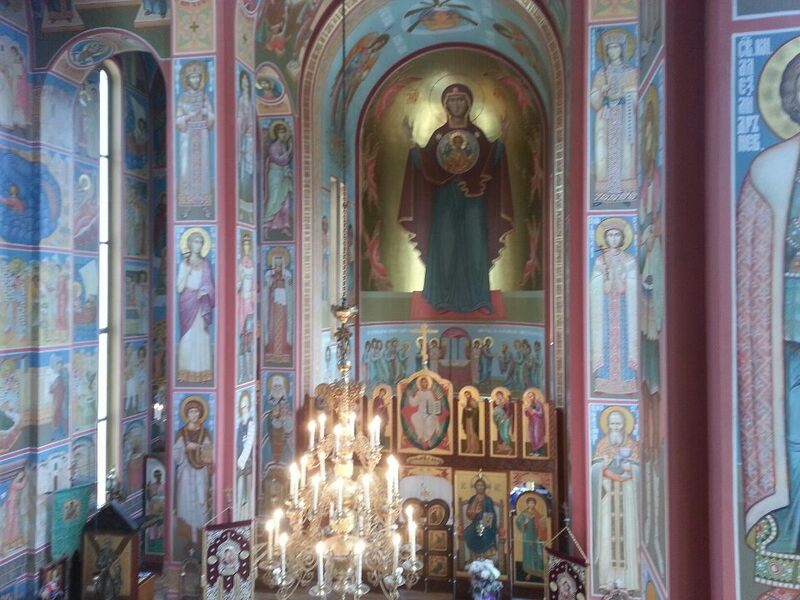 It was a joy to participate in the life of this Orthodox community during my time in Edinburgh (though I must confess, I spent so much time traveling around the UK and in France that I was not at Liturgy as often as I should have been!). I heard that the community was trying to move from the house at 2 Meadow Lane to a former Church of Scotland parish which is larger and can accommodate more worshipers. How is all of that going? Thank you for letting me know of Fr. John’s repose. I am sorry for the deep sense of loss that everyone must be feeling in the community, but I am glad to hear that he was able to put these final affairs in order shortly before his falling asleep in the Lord last Wednesday. I had wondered if he might have reposed, since several people began posting lovely photos of him on the community Facebook page late last week. It is clear that he was beloved by so many Orthodox throughout Scotland, and indeed, all Britain. He was ill last year, but I will always remember how he beamed at the very center of the community life during Pascha last year, my first as an Orthodox Christian. Amid the paschal joy of the Resurrection, the dear man truly came alive! I will always remember the joy which lit up his face as the midnight pashcal vigil began. He was such a kind man. May his memory be eternal and may he dwell with the righteous! Thank you for your kind words about this little blog. I look forward to seeing you at St John’s for the Liturgy on May 12. Are you still in Edinburgh at present? Greetings Ryan! Yes, email might just be better in general anyway. Send a message this way: jonandrewgreig@gmail.com. (I also understand the context there—no worries.) It’s too bad WP.com doesn’t have some kind of private message feature like Facebook…also unfortunate that I don’t have it for that, although for various reasons I’m off. Anyway, look forward to hearing from you there. Also, did you get to meet Joshua and Molly Genevieve Falconer? They (or at least Joshua) visited St John the Baptist at a few different points, and I guess he/they were at Metr. Jonah’s talk from a week ago—which I’m enjoying listening to at the moment. So in brief, yup, still in Edinburgh. I just finished off the spring term, about to finish my last deadline with a Greek exam before I start work on my master’s thesis. Likely working on comparing Aristotle and Plotinus on their conception of the first principle/Prime Mover. Eventually I hope to tie this in with my doctoral research which will eventually look at Pseudo-Dionysius on God’s absolute transcendence. More or less this is fulfilling an interest I started having in the Eastern/Western conceptions of God as I was finishing my undergrad. And yeah, St Andrew’s is still in the process of moving… some very fortunate events have happened recently, which I’ll probably just save for email. Anyway, more to share later. Nice to hear from you, and look forward to connect. Take care. Ryan, wonderful blog and praise God I found it. Please send me your email offline as I would like to correspond with you. I’m planning to visit St. John the Baptist soon. Thank you. Thank you for your kind comment about my blog, Wayne. I just e-mailed you, and I look forward to talking more with you. Hopefully our paths will cross at St John’s sometime soon! Hello, Ryan. I’m an adjunct professor at American University, teaching a spring graduate course on intelligence in the School of International Service. I’m also a subdeacon at St. Mary’s in Falls Church, Virginia (under Archbishop Nathaniel). I’d like to make contact with the OCF at AU. Are you speaking of the Catholic Orthodox Byzantine or the Orthodox ? 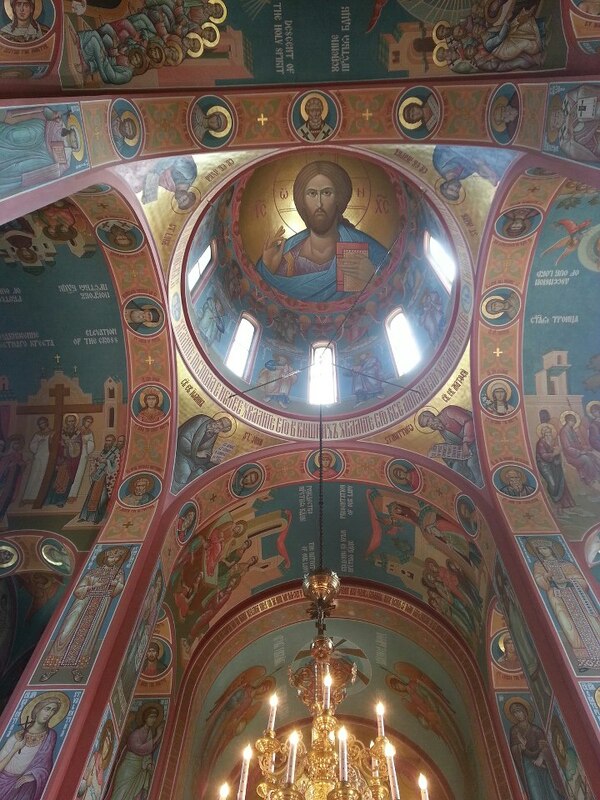 Since you are in DC, have you ever visited The Sacred Monastery of Saint Nina in Union Bridge, MD? It is just west of Frederick. Greek nuns under Georgia Patriarchate. They are dear friends of mine and (I know that I am biased) are my favorite monastery in the US. 130 acres of beauty tucked away in the rolling hills of Maryland. They have only been there three years but are becoming better known quickly. A small correction…Greek nuns in that they’re spiritual elder is Greek. They are mostly Americans but have many different nationalities represented. Thank you! May He bless you as well! Happy to discover your blog, Ryan! Do you have a youtube channel or other acount where you share your experience through video blog or something like this? Hi Ether! I have a YouTube channel, yes, but I almost never use it. I am very happy to hear from you! I love France, and miss it. I long to visit Georgia. I came to your blog today via the “Monarchies” facebook page. After poking around a bit, I figured I ought to say hello–greetings from a fellow former-Catholic-now-Orthodox named Ryan! I also count myself as a Monarchist, and I’ve also got an interest in international law and politics… I earned a law degree and did an internship in the Hague before leaving the whole thing shortly after passing the bar exam (I teach high school math now, and couldn’t be happier with that decision). Anyways, I am enjoying your writing so far. Keep up the great work, and I look forward to chatting with you soon, be it here or on the Monarchists facebook group or some such. Hey Ryan. What’s you twitter? Lifting you and your intentions up to GOD in prayer with love through the Hearts of JESUS and Mary, GOD bless and protect you, dear brother in Christ. Please forgive my long delay in writing to you, as I did not see your comment until now. Thank you very much for your kind words and your prayers. I can certainly ask my own spiritual director–I’m afraid I don’t know of any Catholic people in Kentucky. Perhaps contact your local diocese and ask if they would recommend any particular priest as a spiritual director? Are you affiliated with a particular convent or community of women religious? They might be able to recommend someone to you as well. Thank you again for your kind prayers! I will keep you in my prayers as well.